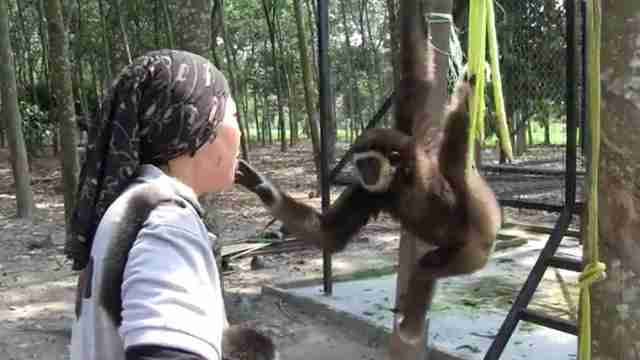 The moment Mariani Ramli held the baby gibbon in her arms, she knew she’d do absolutely anything to protect him. In 2012, rescuers found the baby gibbon, named Ellek, clinging to the body of his dead mom in an area of protected forest in Malaysia. While no one knows exactly what happened to his mom, Ramli believes poachers shot her with the aim of taking Ellek to sell as a pet. But something must have spooked the poachers, because they’d taken off without Ellek. The mother gibbon’s body was cold when rescuers found her, which led them to believe she’d been killed several days ago — and Ellek had probably been holding on to his mom the entire time. Ramli, who previously worked as a wildlife ranger with the Department of Wildlife and National Parks in Peninsular Malaysia, offered to act as Ellek’s surrogate mother. Ellek was only about 6 or 7 months at the time, and he needed around-the-clock care similar to a human baby. Even though Ramli knew she could never replace Ellek’s real mother, she tried to teach him everything he’d need to know to survive in the wild. A year later, Ellek contracted a dangerous bacterial infection. Ramli did everything she could to nurse Ellek back to health, but unfortunately, Ellek passed away a few weeks later. Ramli still doubted if she had the expertise to care for Daru. 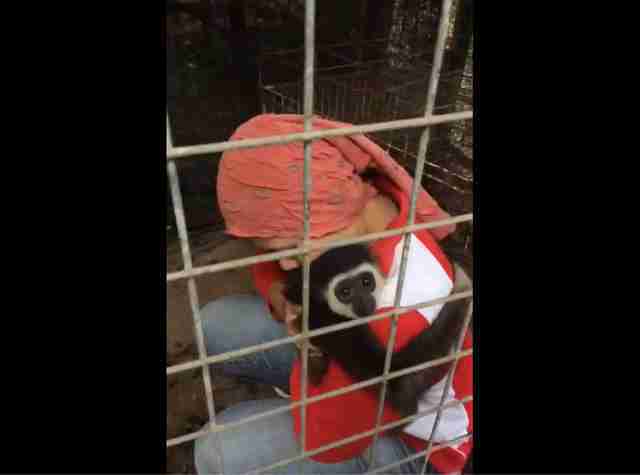 But at the same time, she didn’t know of any rescue centers in Malaysia that specialized in gibbon rehabilitation, nor any experts who were trained to look after the species. So she knew she had to be the one. Despite the challenges, Ramli worked with Daru tirelessly, and he’s slowly getting better. But Daru isn’t the only gibbon Ramli cares for — she’s currently looking after five other gibbons at a small rehabilitation center at her home. But Ramli knew the issue was much bigger than the handful of gibbons in her care. In Malaysia, gibbons face a plethora of problems, including habitat loss from deforestation and development, poaching and trafficking. There are actually three types of gibbons in Peninsular Malaysia, according to Ramli, who now works as a primate specialist for the International Union for Conservation of Nature (IUCN) — white-handed gibbons, dark-handed gibbons and siamang gibbons. The IUCN lists all three gibbons as an endangered species, and in Malaysia, although gibbons receive very little protection by the Malaysian government, Ramli explained. “There’s no specific protection only for gibbons, while there is already special protection programs for tigers, elephants, tapirs and other animals,” she said. For Ramli, the most concerning issue is the pet trade. Dozens of gibbon families are hunted in the forests of Malaysia each year, according to Ramli, and captured babies are sold for prices up to MYR 8000 (about $1,900 USD). 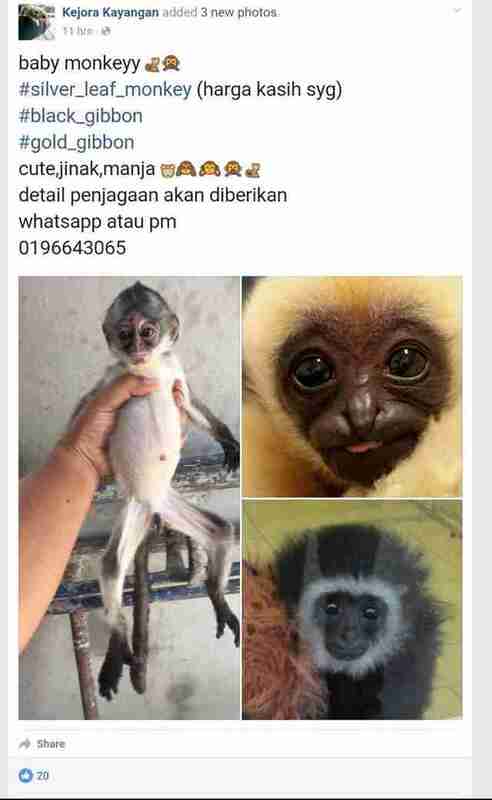 While it’s technically illegal to keep a gibbon as a pet, the Malaysian government currently has no laws in place to prosecute people who buy or promote illegal wildlife on social media sites like Facebook, Instagram and WhatsApp, Ramli explained. 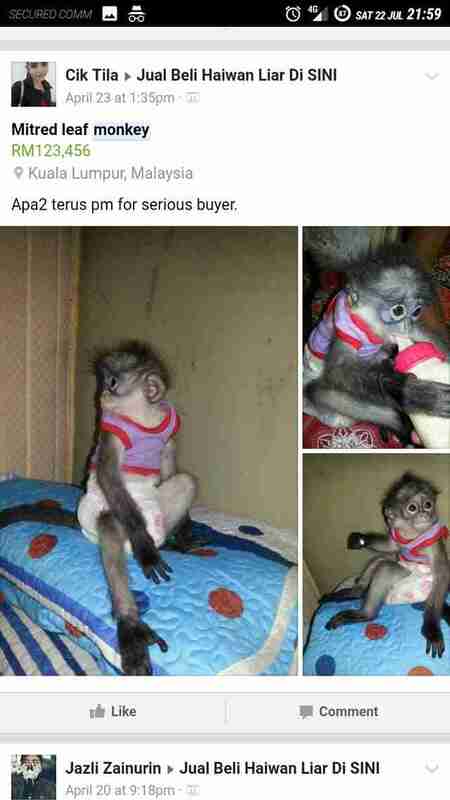 To make matters worse, the pet trade is being fueled by Malaysian celebrities who post images of themselves on Instagram with pet gibbons, although Ramli says that many of these accounts have subsequently been taken down. To help put a stop to this pet trade, and to help gibbons get more protection under Malaysian law, Ramli founded the Gibbon Protection Society Malaysia (GPSM) last year, an organization that aims to spread awareness about gibbon conservation in Malaysia. Ramli is also working to open a rescue and rehabilitation center for gibbons, which would be the first of its kind in Malaysia. While Ramli remains hopeful for the future, she knows that there’s no time to lose to save these iconic animals. 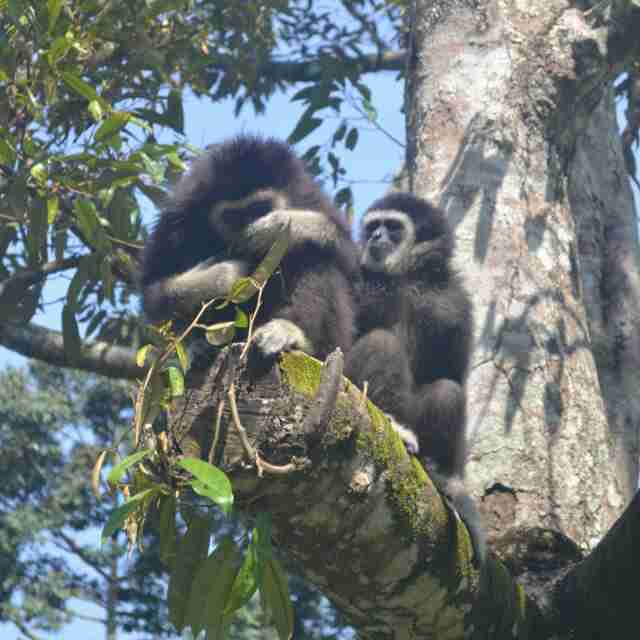 “With so few gibbons left in the wild, the life of every single gibbon matters,” Ramli said. 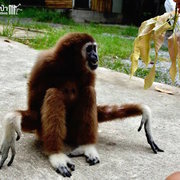 To help Ramli spread awareness about gibbon conservation through GPSM, and to help her build a gibbon rescue and rehabilitation center, you can make a donation. You can also follow GPSM's work on Facebook.